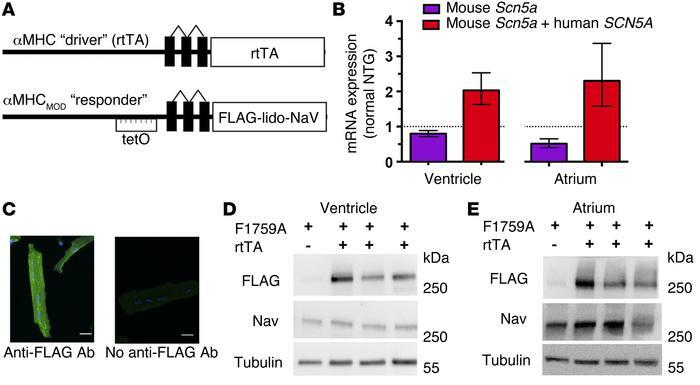 Cardiac-specific, FLAG-tagged F1759A-NaV1.5–expressing TG mice. (A) Schematic of the binary transgene system. αMHC-rtTA is the standard cardiac-specific, reverse tetracycline–controlled transactivator system. The αMHCMOD construct is a modified αMHC promoter containing the tet-operon (tet-O) for regulated expression of FLAG-tagged, lidocaine-resistant NaV1.5 (FLAG-lido-NaV). (B) Quantification of mouse Scn5a and human SCN5A transcripts in ventricle and atrium of F1759A-dTG mice using qPCR. Results are presented as fold difference for each gene against actin by use of 2–ΔΔCT method, followed by normalization to expression of either mouse Scn5a or mouse Scn5a and human SCN5A determined in NTG mice. n = 3 NTG and n = 4 F1759A-dTG mice in each group. (C) Immunostaining of F1759A-dTG mice cardiomyocytes with or without anti-FLAG antibody and FITC-conjugated secondary antibody. Images were obtained with confocal at ×40 magnification. (D and E) Anti-FLAG, anti-NaV1.5, and anti-tubulin antibody immunoblots of cardiac homogenates showing FLAG epitope–tagged NaV1.5 expression in ventricle (D) and atrium (E) of single TG and dTG mice in the absence of doxycycline-impregnated food.